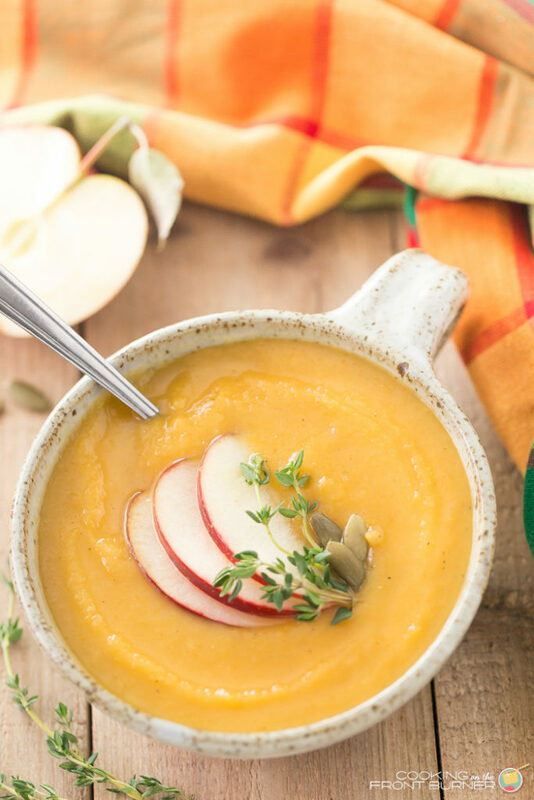 This Easy Butternut Squash Apple Soup is perfect for the fall. 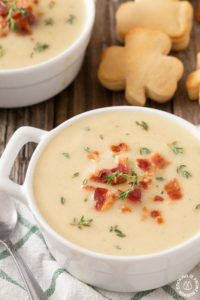 It is so creamy, comforting and delicious! We’re getting into my kind of season – nope, not the holidays (though I do enjoy those too), but to me it’s now soup season. 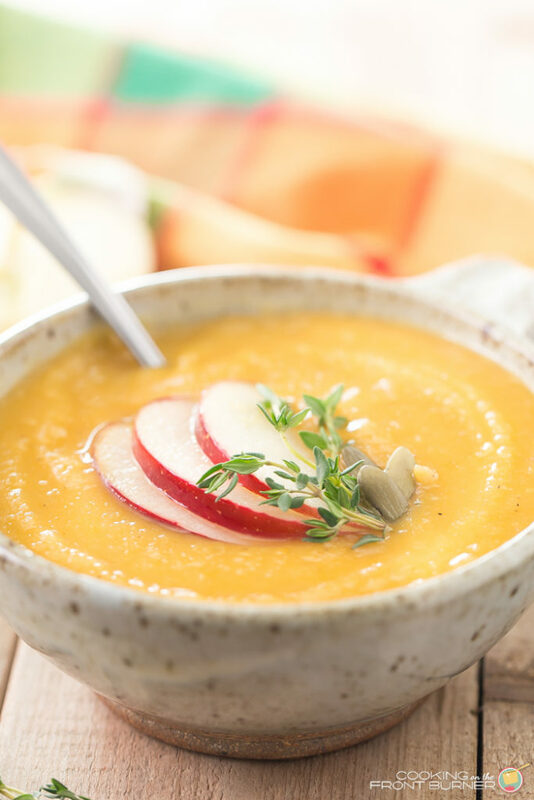 I’m kicking it off with these fall favorite ingredients in this comforting bowl of Butternut Squash Apple Soup. It’s made from scratch, really delicious, super creamy, and is under an hour away to being served at your table. How’s that for easy? And oh, did I mention it’s kicked up a notch with a tad of chipotle chili to give it a bit of spice with a smoky flavor? Well, now you know and have all the details. I’m sure you’ll want to be making a bowl of this soon! 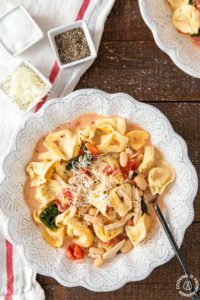 Over the last couple of years I have really enjoyed recipes with butternut squash even though it was not a vegetable I grow up We were more mainstream with nothing too out of the ordinary – meat, potatoes, and pasta (lots of yummy pasta). 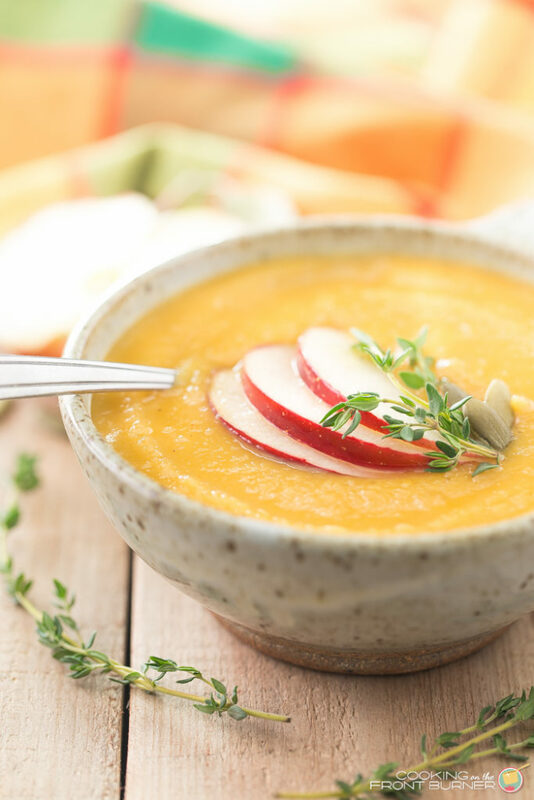 Restaurant trends in the recent years have had sweet and savory recipes with butternut squash on their menu. I’ve had some great dishes and some of my favorites include soup, raviolis, and just roasted with some olive oil. It’s a “plays well with others” type of veggie. Of course soup can be a meal all on its own with maybe a nice warm loaf of crusty bread but it also is a great way to start a holiday meal (and we have two of those coming up). In our family, we always have some sort of soup to start out our Thanksgiving meal. 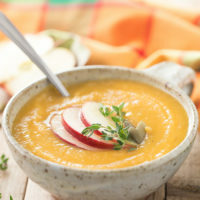 In the past, I have made Pumpkin Soup but I’m thinking this year to switch it out with this one to see how the family likes it. 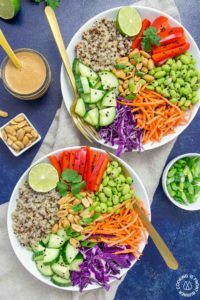 Fun to try new recipes! If you want to get this soup on the table a bit quicker, you can buy butternut squash already cubed. It costs a bit more but is a time saver for sure. A comforting bowl of soup that is easy to make and so creamy! Love the fall flavors in this soup! 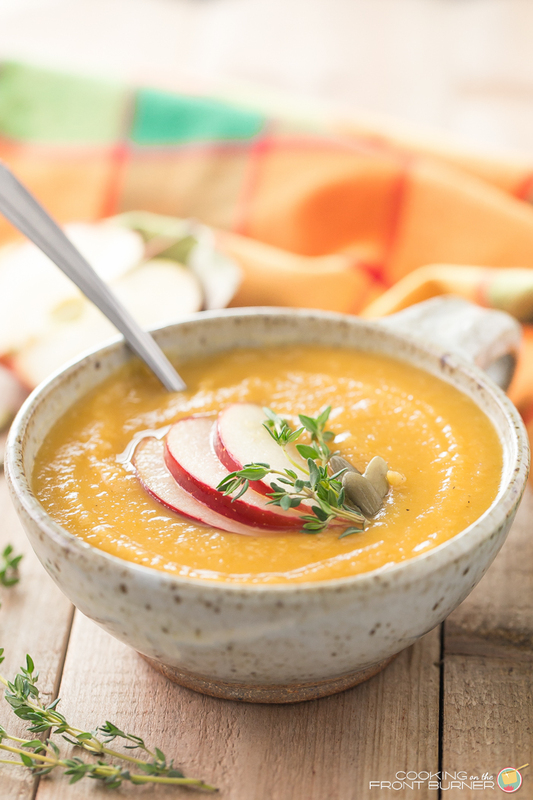 I've made butternut squash soup with pears but not apples — I can't wait to try this! As usual your photos are just gorgeous! This sounds absolutely delicious, Deb! I didn't grow up eating butternut squash either, but I sure love it now! This soup looks phenomenal! I love these flavors together! This soup sounds so perfect! 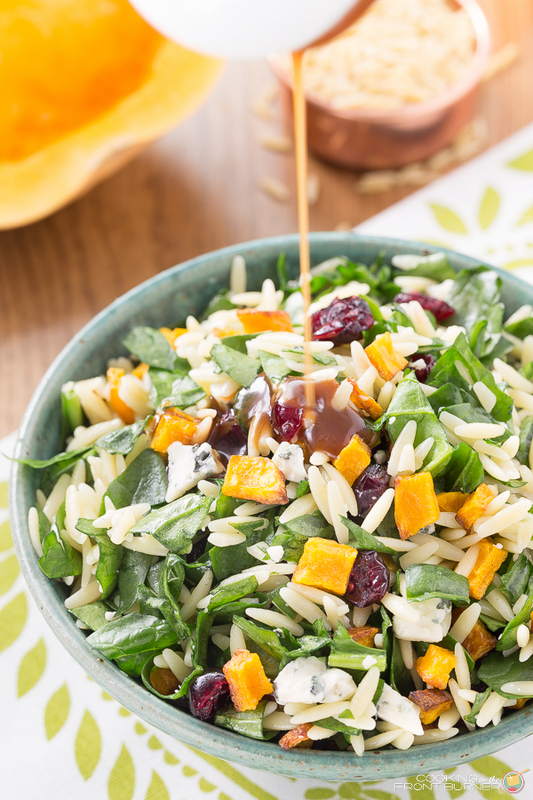 It's such a dreamy fall food! 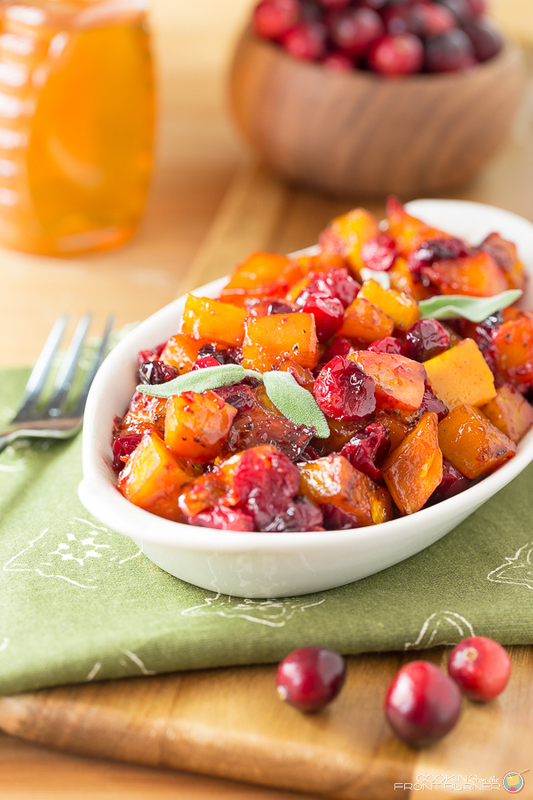 I just bought some butternut squash at the store – this looks like a great recipe to try! Hi Deb! 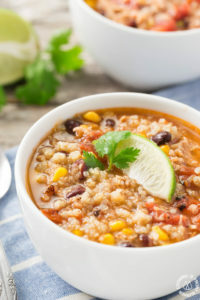 Your soup looks amazing!! Just made this! Perfect for this very cold & windy day. I’m glad you personalized the recipe. It’s cold and windy here today too!